I am very glad to see that, more and more often, Isis is being rightly identified as Goddess of Magic. It wasn’t always so; ten years ago, you would hardly have seen Her “defined” (as if one could define a Goddess!) in that way at all. Instead, She would be “a fertility goddess” or “a mother goddess” or “a goddess of motherhood.” And it’s not that She isn’t those things; She most certainly is. But the foundation of Isis’ fertility and holy maternity is Her command and embodiment of the ultimate creative power of the universe—the power of magic; in Egyptian, heka (HAY-kah). The hieroglyphs for heka; the twisted wick is the h; the upraised arms are ka. A key reason is a change in attitude. Modern scholars are much more sympathetic to the idea of magic than were the turn-of-the-century scholars with whose work many of us began our research. This is true in Egyptology and in general. The role that magic has always played in human cultures and religions is much more widely recognized—or perhaps, acknowledged—than it was previously. This fact has necessarily meant that a much less stereotypical view of magic was required—magic had to be more than primitive, peasant, pagan superstition! And so it is. Today’s Egyptologists have a much more inclusive understanding of the relationship between the Egyptian concept of magic and the Egyptian’s relationship with her or his Deities. Rather than regarding magic as some supernatural woodjie-woodjie-that-makes-us-all-vaguely-uncomfortable, scholars are beginning to understand it as the Egyptians themselves understood it. In the Egyptian view, heka is the energy that underlies, interpenetrates, and empowers all things. 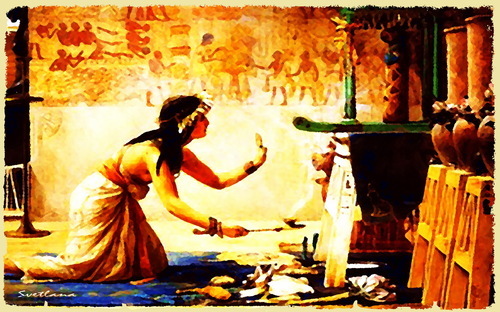 Importantly, the Egyptians also understood heka to be a living energy—the God Heka. And this is vital. It is not enough to tease out the science of heka; indeed, we will not succeed in its discovery unless we develop a relationship with Heka, with Living Magic. If heka—the living energy that creates and underlies the universe—is the power that Isis wields, suddenly we understand Her immensity. We understand why She so awed and was beloved by the Egyptians, why She so easily reached beyond Her native shores, and why She continues to hold the hearts of so many of us today. Isis is magic. She is Iset Weret Hekau, Isis, Great of Magic, Isis the Enchantress, Whose every word is full of the power of creation. She is Hekaet, the Living Goddess of the energy of All That Is. Isis is Holy Power, Sacred Magic; and She has put on the form or kheper of a Goddess so that human beings may interact with Her, creating our own relationship with Her infinite, ultimate energy, and being touched by Her infinite, ultimate love. Next Next post: Is tradition important in the worship of Isis? When you note that “scholars are beginning to understand it as the Egyptians themselves understood it” it really reminds me how much we project our current ways of thinking on historical research. How can one know when one is seeing and interpreting clearly? Good article. I have not always been able to get into Egyptian trad, but I have always liked Isis, and beginning to like Horus, too. Isis does seem to cross boundaries like that! It’s interesting to contrast the viewpoint especially since I’ve been reading my way thru Elizabeth Peters fiction at the moment. Peters has been recommended to me…I intend to check it out soon. I think we may have an audio book of one of there in line.